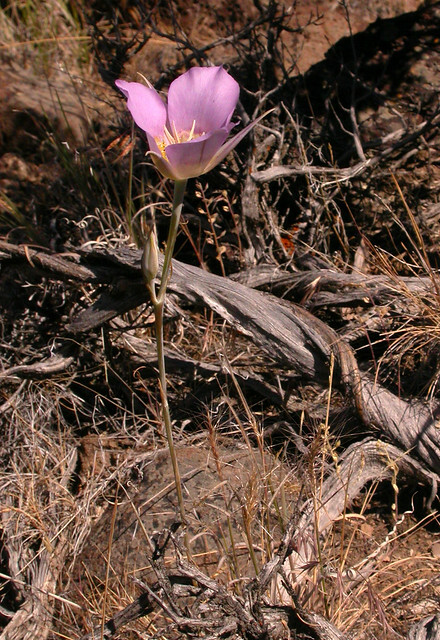 Sagebrush mariposa lily is showy and grows up to two feet tall, with a beautiful tulip-like flower that displays petals, sepals and stamens in multiples of three. Each plant has one to three flowers, and the lavender petals are pointed at the tip, with a darker violet band at the base. The stems grow stout and erect and unbranched from a round starchy bulb, and the leaves are long and grass-like and curled at the tip. The bulb, one of the first to be dug in the spring by the Native Americans, is sweet when roasted or can be eaten raw or ground into a starchy meal.